Everyone of them flew in with no pretense and ultimately all unkind words were forgotten. For the very first time, breakfast with serendipity opened our hearts to caring for something greater than ourselves. Wonderful, and one of the reasons the river is my favorite reflection spot. I greatly appreciate that Laine. Thank You. Lovely! 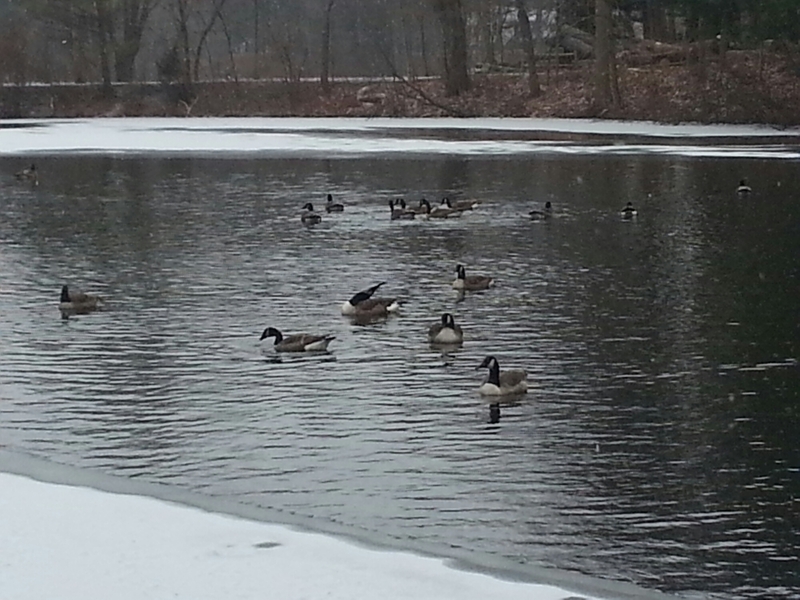 Is this the Duck Pond at the Peabody Institute Library? Thank You so much. The pond is in West Peabody (Crystal Lake). Thank You so very much Nelly. I always appreciate your kind words. That’s a deep one. I love it! How you can keep doing this with quality amazes me! Thank You so very much. You are wonderfully kind and I appreciate it. There is nothing greater than ourselves. Thank You so very much Joanna. Lovely. A peaceful image. May I reblog? You are far too kind as always Kurt. Thank You so very much. Thank you for following me, Edward. My writing 201 assignment for the weekend is poetry potluck. I will pick two poets. You were the first I thought to reblog and Margaret Young, I will have to find her book for. Do I have your permission? I will pingback to your blog if that is okay. I will wait for your response. I am always surprised that you follow your two sentence format. Pleasantly, surprised. No matter your subject matter, I enjoy the accompanying photographs that you take/pair with your poems. Thank you for your precise emotive writing. Of course and Thank You so very much. By the way, this is one of the most thoughtful and wonderful comments I have ever received. Once again, Thank You so much. What a unique and challenging blog idea you have going here – the two sentence thing. Enjoyed reading a bunch of them. Kind of like poetry and I enjoyed the simplest ones most. Thank You Shirley. I honestly appreciate it.